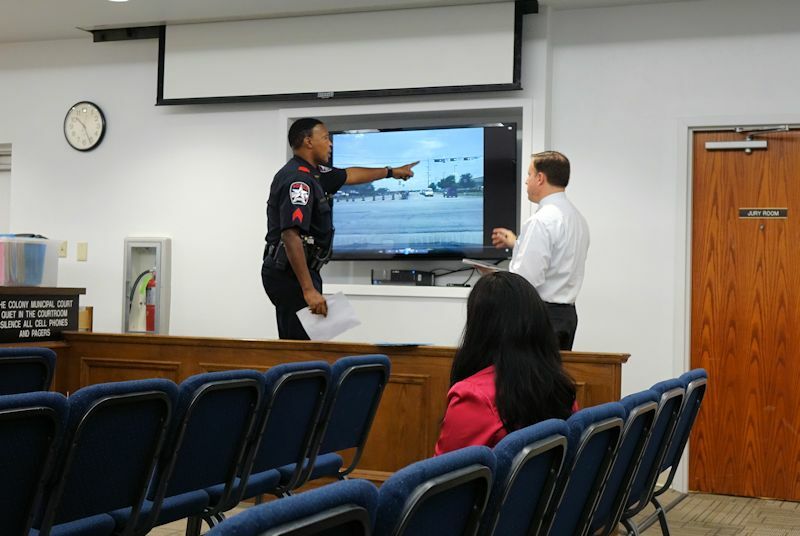 Answers to those questions aside, motorists pulled over for alleged Class C misdemeanor traffic violations in The Colony eventually end up pulling in at The Colony Municipal Court, 5151 North Colony Blvd., where such offenses are processed. 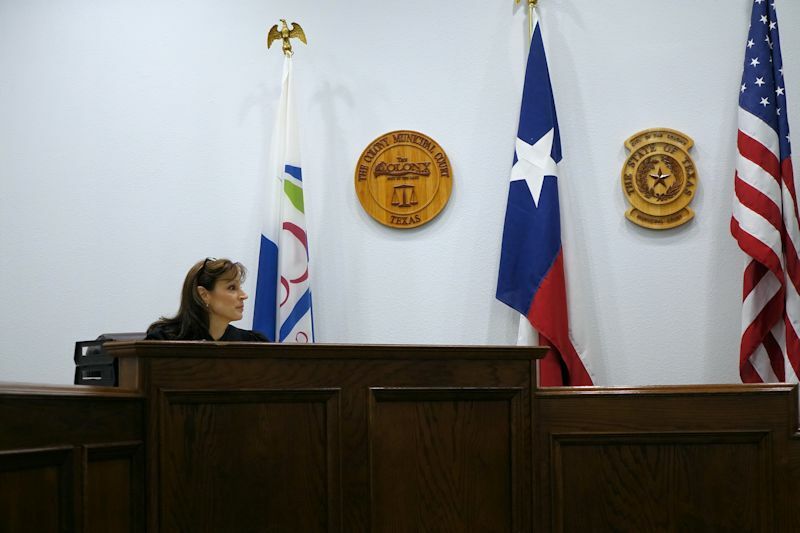 Judge Kimberly Lafferty presides over The Colony Municipal Court. Municipal Court Judge Kimberly Lafferty presides over the court. In addition to her judicial responsibilities, Judge Lafferty is also a practicing attorney with Lafferty Law Firm, PLLC. The Municipal Court Judge is an independent appointment by the City Council and not a member of the city administration. Lafferty has held the post for five years. Court Administrator Patti Ristagno, a 29-year veteran of the department, said traffic violations represent about 85 percent of the court’s average caseload. Class C misdemeanors in violation of state law, such as public intoxication, theft less than $50, assault by contact, and disorderly conduct, comprise about 10 percent of the cases. The remaining 5 percent are city ordinance violations. The Municipal Court is also responsible for processing and issuing arrest warrants stemming from criminal offenses occurring in The Colony. Two officers from The Colony Police Department are assigned to the court as both warrant officers and bailiffs. The judge is also on call 24/7 to sign warrants or conduct arraignments at The Colony Jail. Regardless of the offense, Judge Lafferty said the primary purpose of the court is to provide the accused an opportunity to share their side of the story. The court is in session twice a month for pretrials, bench trials, and the rare jury trial. When in session, defendants may meet with the prosecutor to resolve or dismiss their cases before trial, or go before the judge to contest the charges or share circumstances surrounding the offense in the hopes of lessening their sentence or fine. Most cases, however, don’t make it to trial. Ristagno and her staff of four clerks process the bulk of the cases at the court’s customer service window during regular business hours 5 days a week. Most of those options are only available when defendants choose to plead guilty or no contest. If they plead not guilty or refuse to enter a plea, then the court administrators schedule a court date for a jury or bench trial during one of the two days each month court is in session. Ristagno said defendants should expect to spend about half a day at the court if they choose to have a trial. On pretrial days, about 150-200 cases are reviewed. 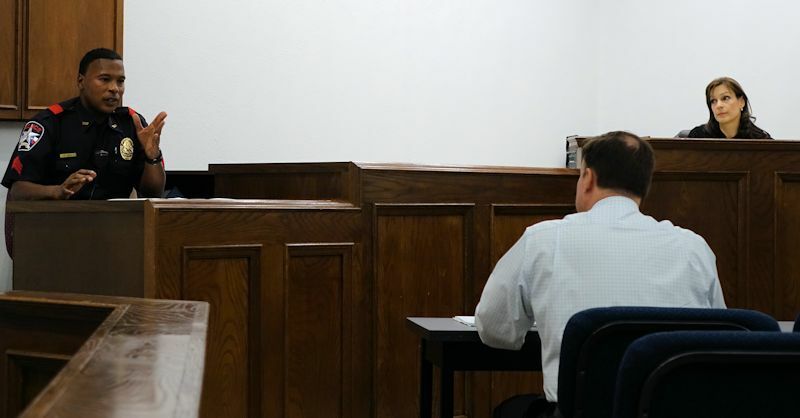 Often times defendants move forward seeking a trial in the hopes they will have the ticket dismissed because the police officer who pulled them over won’t show up in court to testify. TCPD Sgt. Ed Hall, left, testifies for the prosecutor regarding a moving violation during a bench trail at the court in August. Ristagno stressed that the court clerks cannot provide any legal advice. They can only provide options, of which there are many. The clerks are responsible for understanding all those options, including the fee schedule set by state law. What many people may not know is that the city pays state taxes for each violation, the cost of which is passed on to the violator. At the end of each quarter, Ristagno compiles a report and submits state taxes to the Texas Comptroller. In some cases, like most moving violations, the state gets almost half of the fine. Moving violations get the most state taxes, she said. The fine for running a red light, for example, is $195. Of that, the state gets $84. High-end fines include driving without proof of liability insurance ($350), parking in a handicapped zone ($500), driving with a suspended license ($500), and passing a school bus loading or unloading students ($610). Ristagno said driving without proof of insurance is an all-too-common ticket and often easily avoided if motorists would simply make sure to have a copy of their insurance card in their vehicle or on their person at all times. The Colony Municipal Court features a large, flat screen television where participants can review evidence, such as an officer’s dashboard camera footage. Defendants also have a deferred option where they can get insurance and keep it current for six months, after which the ticket may be dismissed. Ristagno stressed that the Texas Department of Public Safety has a surcharge system, called the Driver Responsibility Program (DRP), that adds additional charges to maintaining one’s driver’s license. A conviction for driving without insurance is reported to the DPS, who charges the offender $250 per year for three years. Failure to pay the surcharges can result in a suspended driver’s license. Other DPR-related convictions include driving while intoxicated ($1,000/year for three years for first offense) and driving without a license ($100/year for three years). “A conviction for driving without insurance stays on your DPS record forever,” Ristagno said. For those who choose to ignore their ticket and not appear in court or pay their fines, the judge will issue a warrant for their arrest. Ristagno processes it, the judge signs it, and it is then entered into a regional warrant system. “No matter where you are in the DFW area, you can get arrested,” Ristagno said. Through the years, more warrants are typically issued during difficult economic times. The ultimate mission of the city’s judiciary branch is to embody the principles of fair and impartial justice administered with respect and equality to all. In carrying out that mission, Ristagno preaches customer service as a big priority for her clerks. 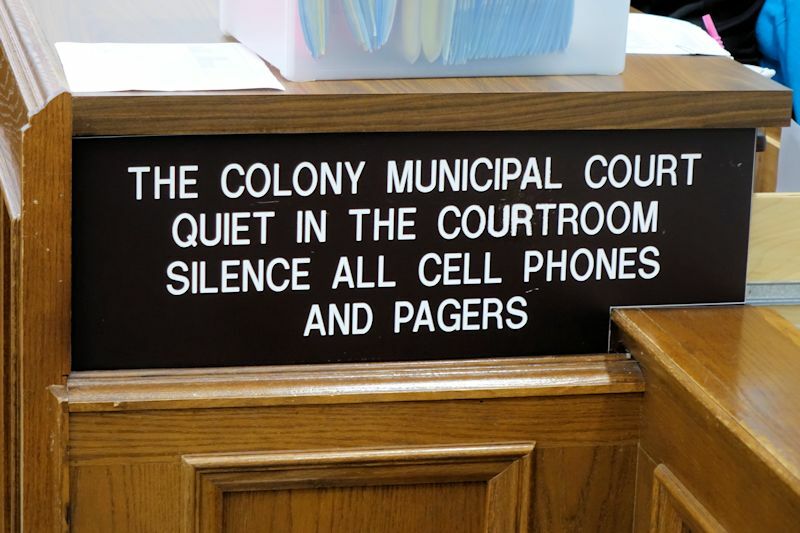 The Colony Municipal Court only handles criminal cases. Civil cases within the jurisdiction are the responsibility of the Justice of the Peace Precinct 2 Court at The Colony Government Center on Main Street, presided by Judge James DePiazza.